Below is a triskele that was custom designed for a wedding in June 2014. It measures 29" in diameter. The pressed glass lion in the center is lightly iridized and one of a kind, just like the beautiful couple getting married! I'm always looking for new and weird things to use in my art. 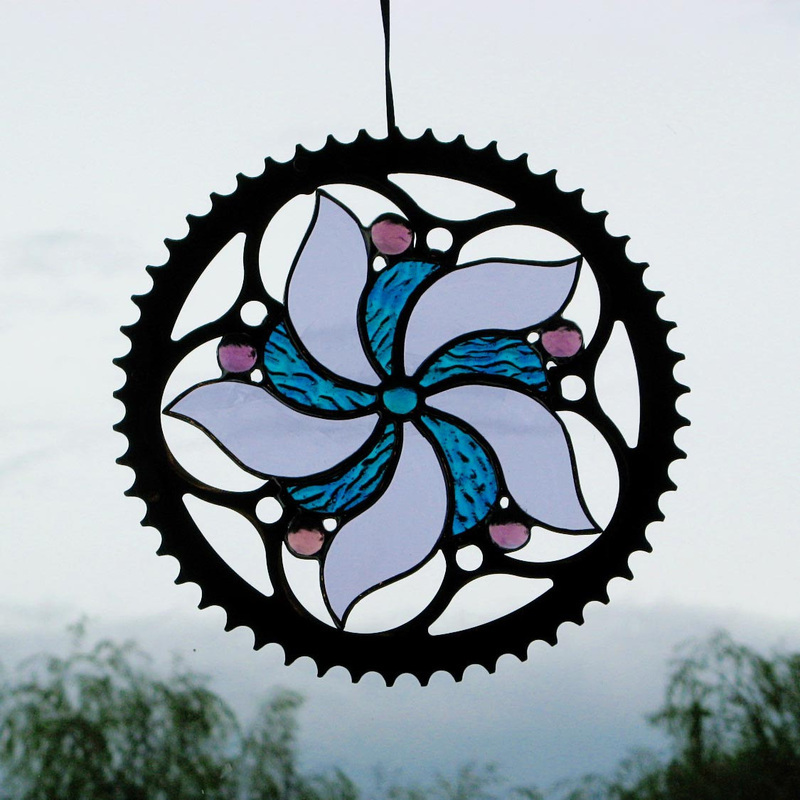 I came across this bike sprocket, and the negative space called to me. I quickly sketched up this flower and began working on it. 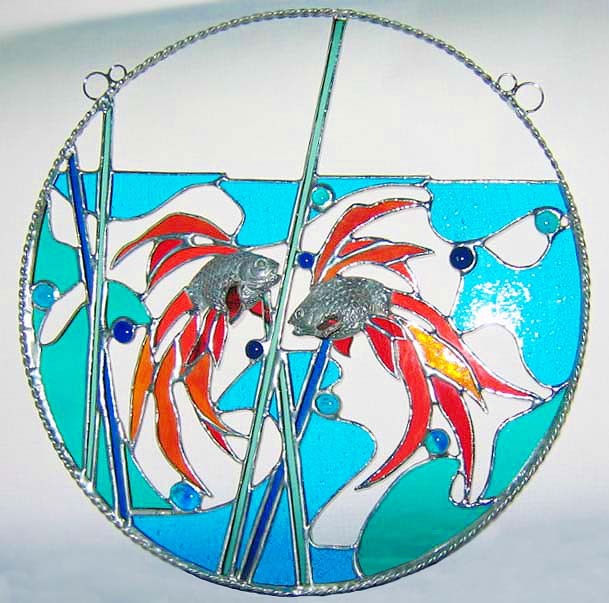 I love the final result and now I'm on the lookout for sprockets, gears, chain rings - anything with an interesting open space to fill with glass! I have always loved the beauty of a snow-covered winter day. Something about the snow is magic to me. The quiet, blanketed Earth and the tiny ice crystals drifting down to us from the heavens. They sparkle rainbow colors in the sun, and each flake is different ... every one a work of art by the Divine. I've read several books on the science of snowflakes, and I can't get enough of the high resolution macro photographs that have been published and made available online of snowflakes. 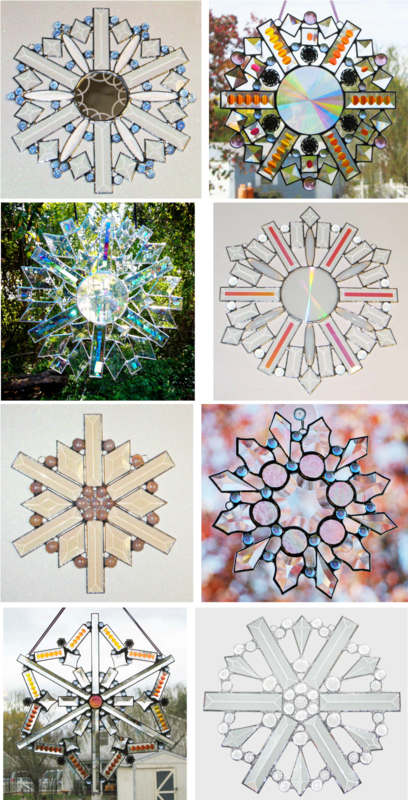 My work with bevels, jewels, and glass nuggets is my way of expressing the beauty I see in each snowfall. 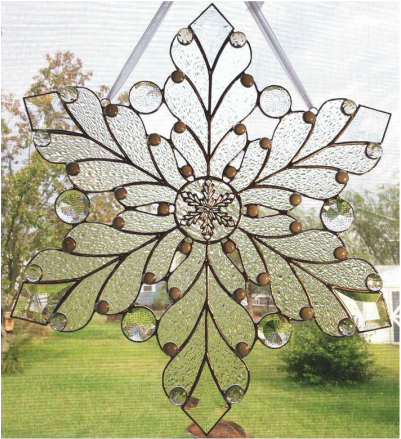 Large stained glass snowflakes from 10-18" in diameter. Made with bevels, prisms, antique jewels, dichroic bevels, and dichroic jewels for ultimate sparkle! To highlight the beauty of these antique and contemporary glass plates, I've set them in an open panel, framed with twisted lead. 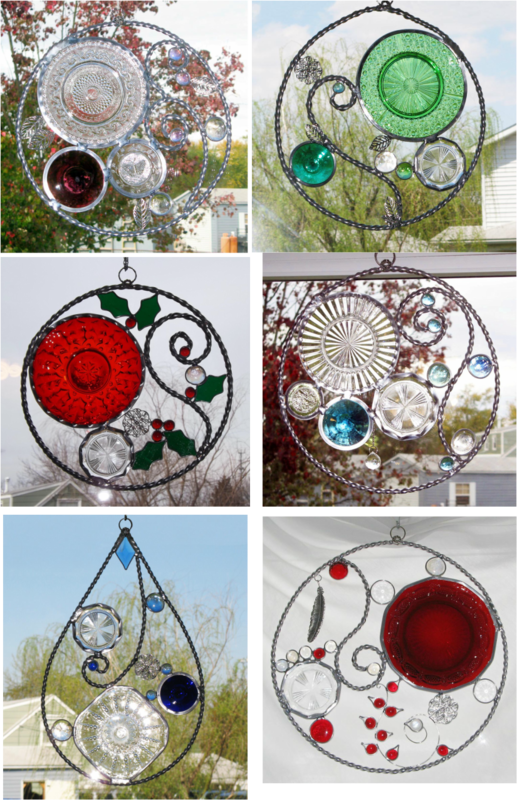 The plates are highlighted by a variety of hand spun roundels, nuggets, beveled jewels, prisms, and metal filigrees. I have always admired the artistry in these plates, and find that they look their best hanging in the sun. I affectionately call these my "swirly panels" and am always on the lookout for beautiful plates to highlight in this medium. 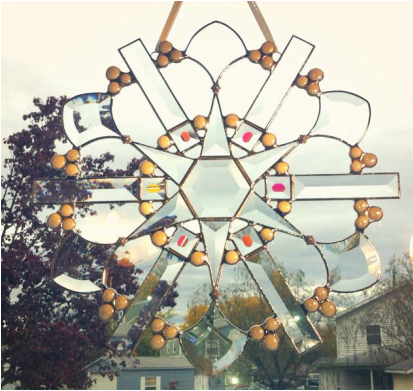 These panels range in diameter from 11 to 15 inches. 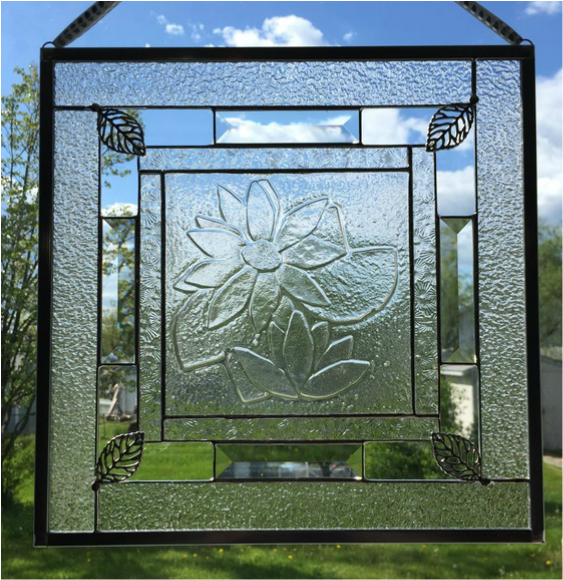 Antique plate leaded glass panels. A good number of the panels I make are commissioned, they're made to express a sentiment from my customer to their intended recipient. It could be a vow of marriage, an expression of love to a spouse or child, or a demonstration of gratitude. I'm always happy to help someone send a lasting message through glass. A fused glass center framed by clear glass textures and bevels. Ocean Cirque - This panel started with the beautiful slice of aqua agate in the center and evolved in various shades of aqua, teal, emerald, and sea foam. 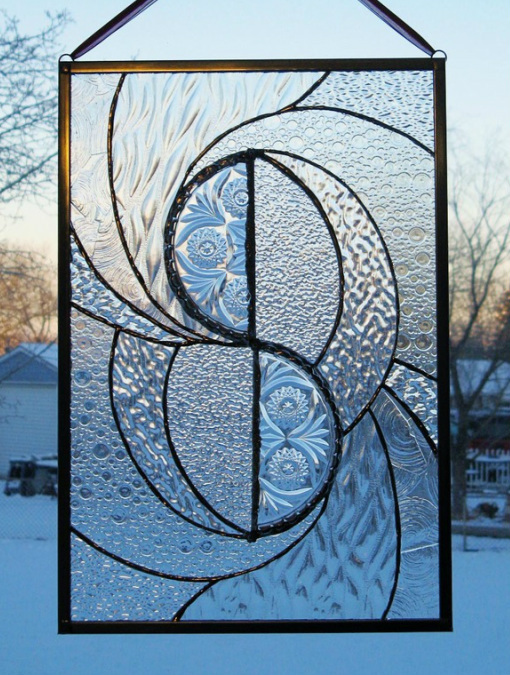 The teardrop of glass hangs in an opening to capture and highlight the negative space. Two Maidens by a Stream. 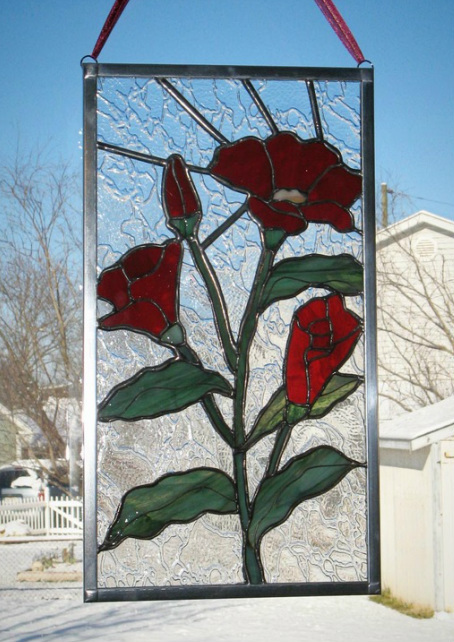 Made with both antique glass and modern glass. 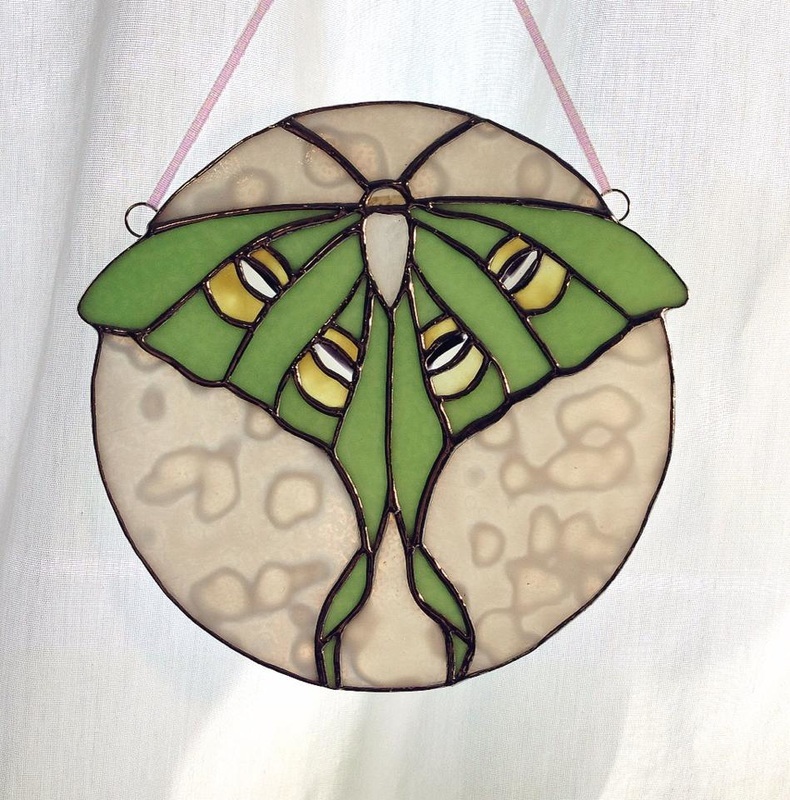 Luna Moth stained glass panel. Another Luna Moth. I find these guys captivating! 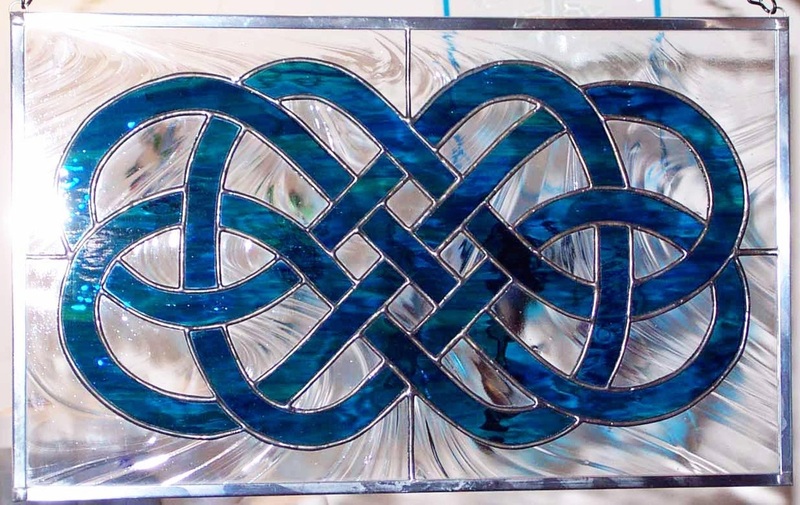 Irish Trinity Knot (Triquetra) in stained glass. Koi Fish in a Pond. This unframed piece was part of a multi-artist collaboration. I was unable to photograph the final work. This knot is known as the Endless Knot of Love. No beginning, no end. It's a perfect wedding gift. 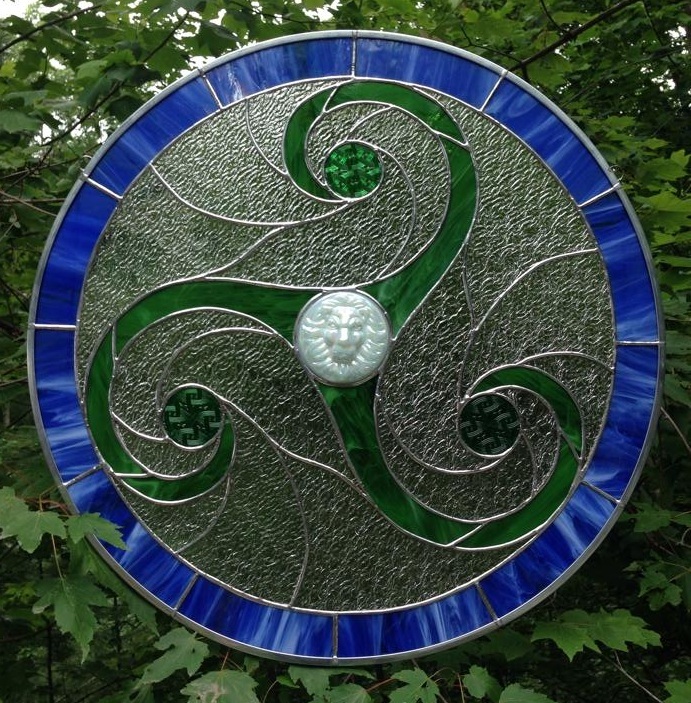 Blue Starburst with a cast glass face in the center. Goldfish in a Ring. The bodies of the fish are cast lead. Abstract Swoosh stained glass panel. Clearly Infinity - This panel started with a broken antique glass dish and evolved into a symphony of clear textures all swirling in harmony. Poppies - My favorite summer flower, these poppies are brilliantly rich in red. Mandala in purples, cranberry, blues, and aquas. 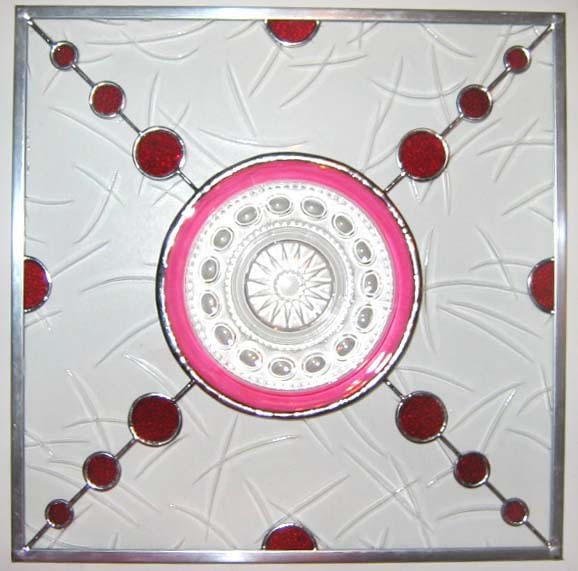 Cranberry Antique Plate centered in a stained glass panel. Man in the Moon Mirror for a nursery. Small circle panel inspired by a Crop Circle. Quilt Square panel with beveled glass. 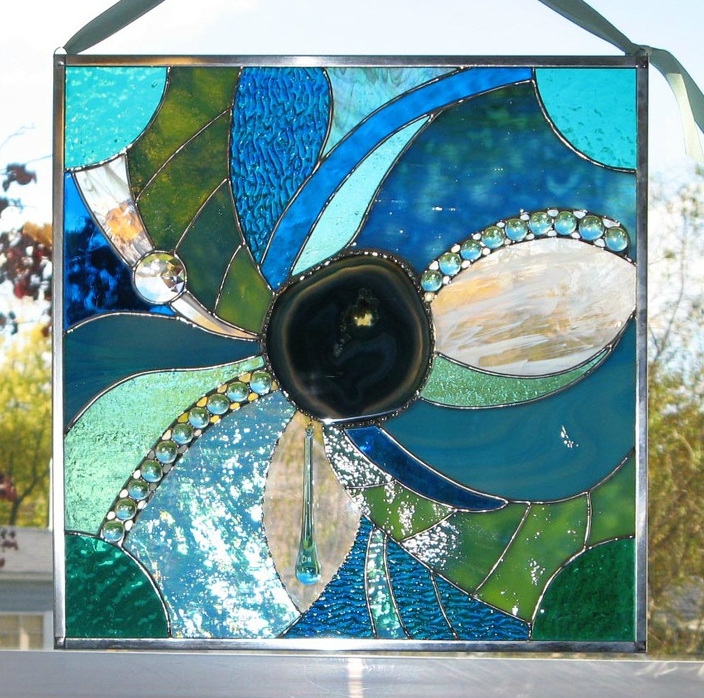 Beveled Butterfly stained glass panel. 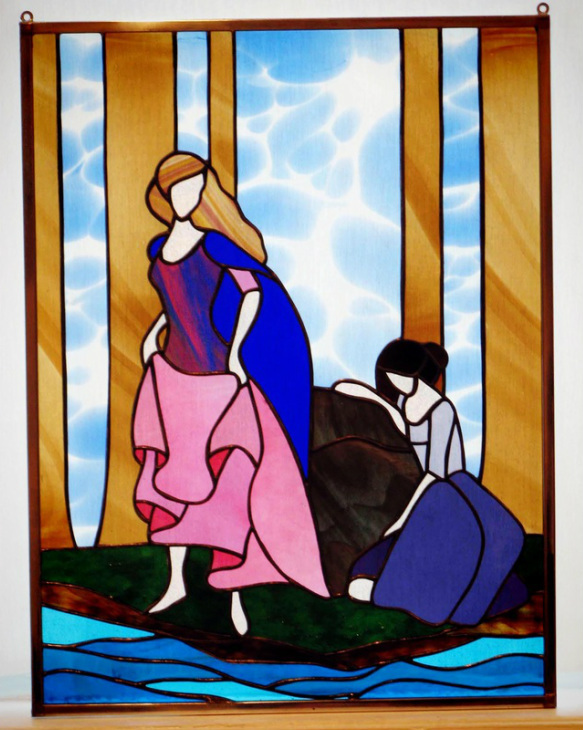 My first stained glass panel! I adapted a quilt pattern for this panel. My mother still hangs it in the kitchen every year for Christmas.